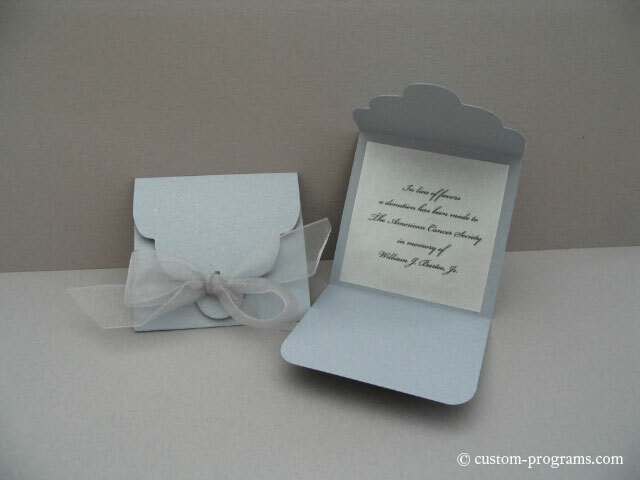 These adorable cards can work as a placecard and also contain a personal note to your guests. Many couples are choosing to donate to charities in lieu of favors - this is a wonderful way to let your guests know a contribution was made in their name to a favorite charity. Favor cards come standard printed in black ink directly on the cardstock without glue dot seal or ribbon for you to embellish with your own ribbon or accents. Standard Favor Card $0.85 each. Deluxe Favor cards come printed in black ink directly on the cardstock with organza ribbon or satin ribbon bow and are sealed with a glue dot (shown left). Please contact us for additional options to customize this card such as a vellum printed layer (shown right). Deluxe Favor Card $2.00 each.